Almost more than 80% of people all over the world use android smartphones, its casual that we loss our data in computers which can be recovered but mostly when we loss our data in smartphones, specially android, then its really becomes frustrating! Just imagine you have lost all your important contacts, messages, email ids, videos, photos and other multiple type files, can you live without them? I guess not, because they are almost essential part of our life. Considering Android smartphones, sometimes our contacts / messages get lost at that time its really hard to communicate with the people, specially with the close ones. This mostly happens when deleting, restoring factory settings, flashing ROM, rooting, water damaged, screen broken or when something unexpected happens. Well in order to recover this there are some easy and quick solutions to get your data recovered from your android device. We've figured out some best recommendations for the Android Users. Let's have a look at them. 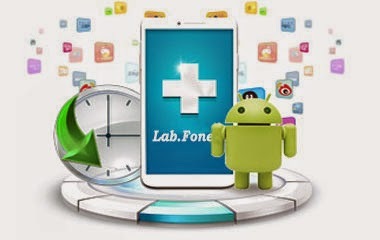 As the name indicates, Coolmuster Lab.Fone is the tool which recovers the lost or deleted data from your android smartphone's internal memory or sd card, it is quick and easiest way to recover your data from your android phone as well as tablet. 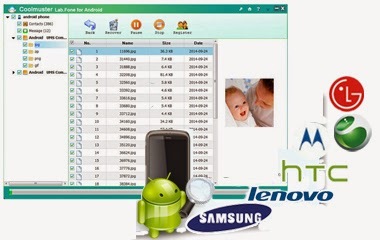 This is a special guide to recover your lost or deleted data from android phone or tablet. So if you loose data from your phone by any means you can recover it easily by making use of this awesome tool to get your lost data back! As the tool is specially made for Android Devices, it is capable of recovering data from all kind of smartphones or tablets (highly compatible with Samsung, HTC, LG, Sony, Motorola, ZET, Huawei etc ) running on Android OS from 2.1 to 4.4. Mostly people love capturing their details of life as today's android smartphones are capable of capturing the photos in high details, but when something unexpected happens during managing your photos or any scenario , you lost your important photos whether they are your personal, loved ones or any kind of, then it comes in mind that "I'm not gonna get them back again" or "How can I recover my Lost photos?" Is it possible to get them back? Yes, It is ! 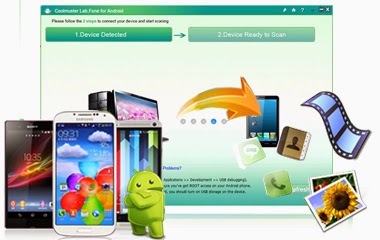 Coolmuster Lab.Fone is the easiest and fastest way, it can recover your lost photos from your phone without any problem as they are in the form of invisible or inaccessible data. All you have to do is follow little easy steps to get your data back, in order to enjoy the complete recovery process you will have to root your android device (doesn't harm your device) as this tool offers risk free data recovery so there is no worries about any harm or any issues. The software supports all windows platform (including Win XP/7/8/Vista/2003/2000/NT) and also Mac OS if you have Mac. Its User Interface is easy as the step by step wizard makes computer handle this software without any trouble. All you have to is download this software (standalone) and run on your system, 3 mouse clicks and your data is restored ! If you can apply all the procedures properly then you are going to get your lost data back, you can check out the complete details for download (Its FREE) and recovering your data from Coolmuster Lab.Fone here. Happy Data Recovering ! and thanks for sparing your time!